When you live on a little island in the middle of a big ocean, you have to make your block of land pay its own way in the most self-sufficient manner possible. The hilly nature of the island provides a great early morning walk work-out. 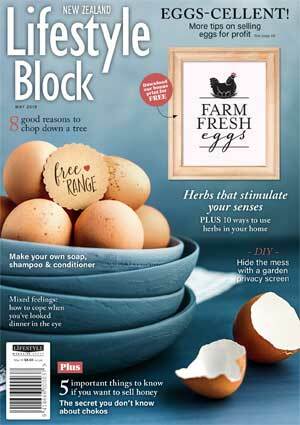 If there’s one thing lifestyle blockers know, it’s how to work hard, and how rewarding it is to live off your own patch of land. 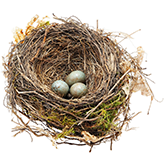 Romantic ideals of semi self-sufficiency are quickly tempered by the realisation that the cost (and workload) of owning and operating a small holding is not for the faint-hearted. Picture then, the added challenge of making your living from the land on 34.5ha over 1000 kilometres across the sea from your nearest neighbour. 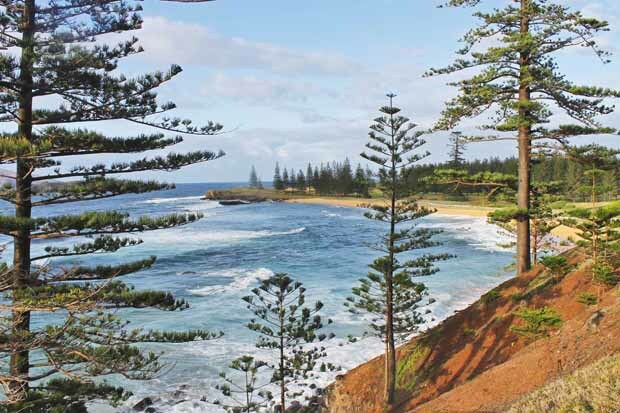 Norfolk Island is picturesque, warm and welcoming. Contented cows wander the roadsides, colourful birds dart between the trees, the lagoon is filled with iridescent coral and bright fish. There’s fine dining, quaint cafes and boutique wines and liqueurs, every tourist’s idea of heaven. But if you’re a local land-holder, it takes a certain degree of innovation and courage to diversify to the extent where you’re providing for your family. 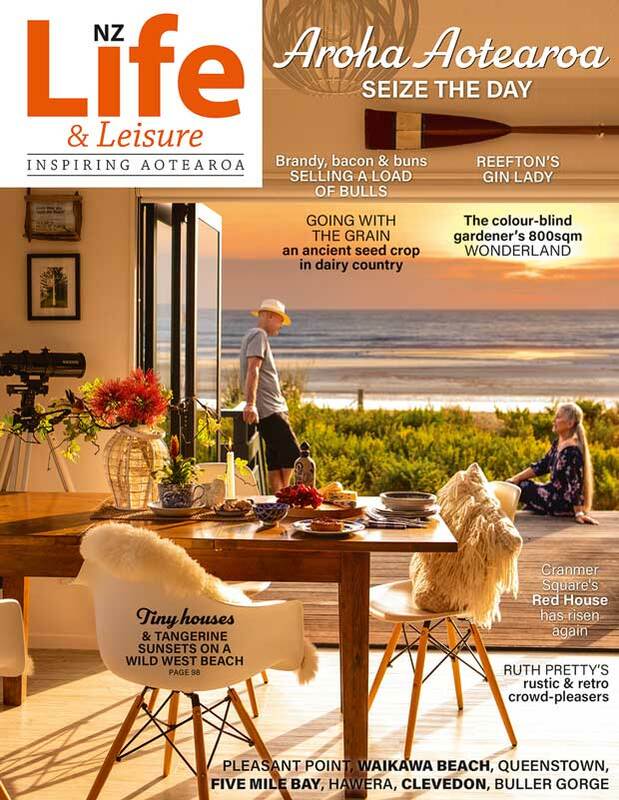 Third generation islander Emily has turned her lifestyle block into a quietly thriving tourism venture. She was working as a flight attendant for government-owned Norfolk Air when it became apparent the carrier wouldn’t be operating for much longer. While looking for alternative employment, she happened upon a documentary on leading Australian cheese makers Carla Meurs and Ann-Marie Monda from Holy Goat in Victoria. Although their lifestyle looked far from easy, Emily says she’s always up for a challenge and was immediately attracted to it. A Churchill research grant later, and she’d embarked on her own goat journey including hands-on experience with milking and cheese-making on a mainland farm, and a stint with the Holy- goaters themselves. She was ready go organic goat farming, Norfolk Island-style. Challenge number one was pretty big – there were no goats on Norfolk Island. When Emily approached the local quarantine staff about her desire to import the animals, they uttered an expletive she’s reluctant to repeat. But that didn’t mean support wasn’t forthcoming. 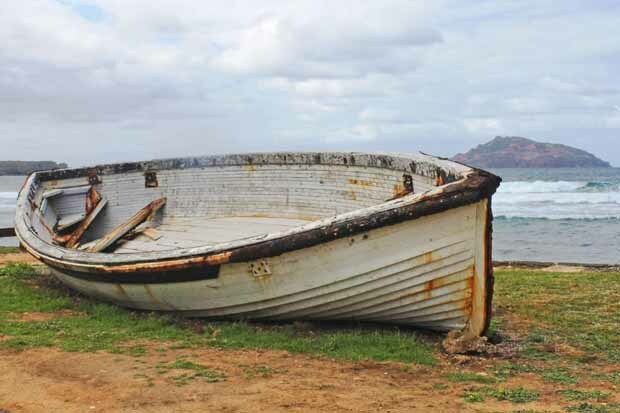 In true, generous Norfolk Island-style, the staff set about making it work, and 15 months after filing the necessary paperwork with Canberra authorities, they were finally able to report back to Emily that Operation Goat was a go-er. There was only one problem: by this time, Emily was pregnant with her first child and almost ready to deliver. Birthing on Norfolk Island isn’t an option so with just one day to go before she had to head out to Australia to wait for baby Charlie to make his appearance, the five goats arrived care of obliging Air New Zealand. Emily immediately placed the animals under the watchful eye of her father (who had never looked after goats before), packed her bags and left. While she bonded with her new baby, the goats began to call Steve ‘Dad’, and still do. Tourists aren’t the only ones who enjoy Norfolk Island’s balmy sub-tropical climate. Its steady year-round temperatures reaching highs of 26°C and a comfortable level of precipitation (rain conveniently falls almost always at night) makes it ideal for goats. Just as importantly, the animals are good for the island. Despite cautions from mainland farmers who doubted the success of a flock deprived of hay (a crop which doesn’t grow on Norfolk), Emily researched alternatives and came up with African olive (Olea europaea subsp. cuspidata) as a fodder. 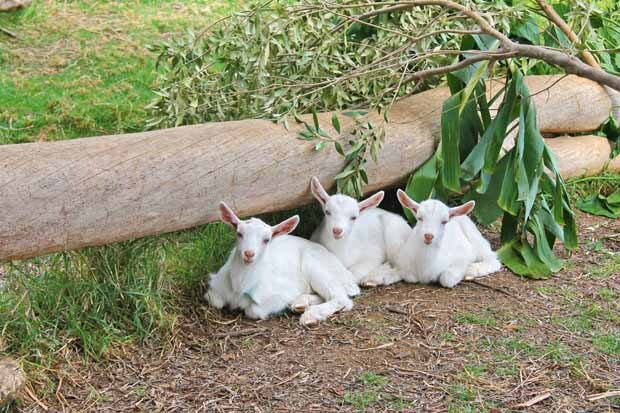 The goats devour it as their food of choice and have thrived, but even better, the olive is a pest plant on the island so it’s a win- win situation for everyone. Feed is supplemented with organic pellets (for the milkers), home-grown corn, hibiscus and mulberry prunings, banana leaves, vege trimmings and sweet potato vines. It all lends itself to a deliciously unique cheese which Emily makes on-site in a purpose-built facility, and sells at the island’s Saturday morning farmer’s market. Slow-cooked feasts are the way to eat when you visit the Hilli Goat Farm. 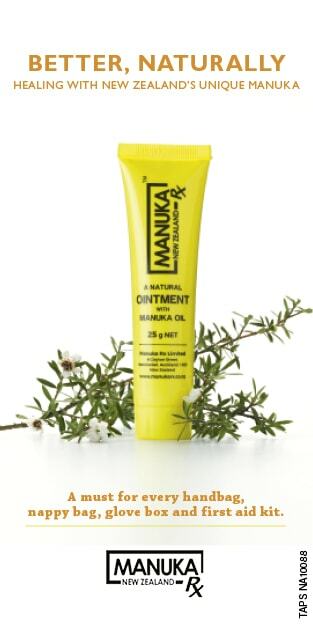 This would be success in itself but Norfolk Islanders don’t rest on their laurels. On this island, the tourist dollar is the main source of income and most farming residents have more than one string to their bow (and several jobs). 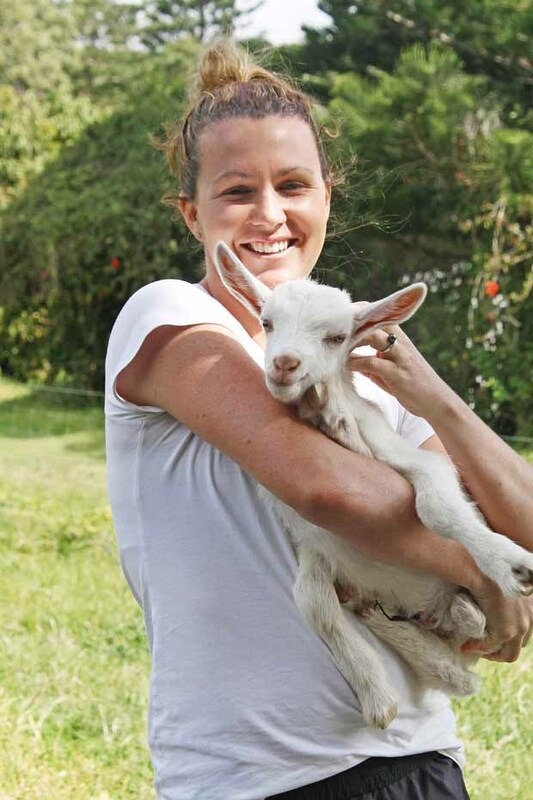 Enter Emily’s next big challenge: to establish farm tours and welcome tourists to Hilli Goat Farm. There are the cutest of animals to see and pet, fine cheeses, and an organic orchard and kitchen garden offering ingredients for the freshest of sumptuous, slow-cooked feasts, so the venture was a success waiting to happen. The extensive organic vegetable garden at Hilli Goat Farm supports Emily, her extended family, and the animals. To top it all off, Emily’s parents Steve and Alison are well-known Norfolk Island potters who live just a stone’s throw from Emily and partner Zach’s home, and were already opening the doors of their studio to visitors. Alison is a dab hand with a kiln and an oven, baking delicious home- made bread to accompany the lavish platters of farm fare that await visitors. But amidst the bookings and gentle bustle, Emily is adamant that small and sustainable is the way she wants to grow her business. A quick glance round the milking shed, where Charlie’s paints and toy bike wait for his next milking-hour visit confirms this is exactly what’s happening. Emily’s philosophy is understandable on an island of just over 2000 residents where almost everything eaten is seasonal and locally grown. Her extended family – Emily’s chef-brother also lives on the property – dine from the property’s orchard and garden, on eggs and meat from their chickens, and catch their own fish. 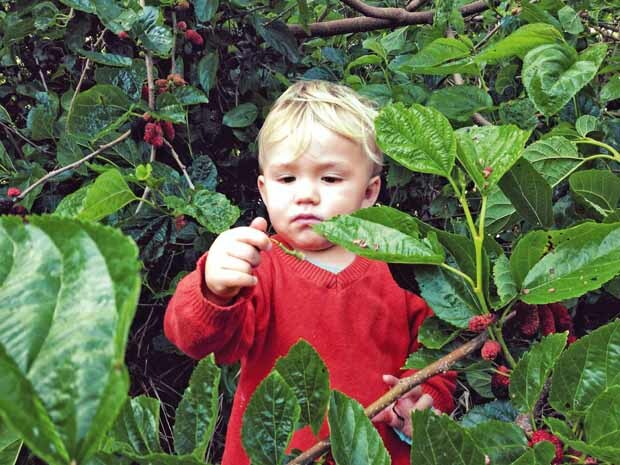 Charlie (2) already knows how to harvest his dinner. That’s why it’s with a certain degree of calm that Emily is now approaching her latest venture, the challenge of creating a wholesome skincare range which will combine her own goats’ milk with locally- produced bee products. Goats’ milk is renowned for its healing and health-giving properties, and the concept dovetails seamlessly into her other flourishing agro-tourism based activities, and also complements several other growing-based initiatives on Norfolk Island. Two Chimney Wine’s platters are like visiting a flower show. Norfolk Islanders living off the land have diversification down to a fine art and that goes for the local vintners as well. Rod and Noelene Buffet McAlpine produce 1000 bottles a year, the first and only vineyard on Norfolk Island. The soft, maritime climate and volcanic basalt soils lend themselves to chardonnay, semillon, verdelho, merlot, and chambourcin grapes. My pick was their sparkling chambourcin, a fresh, light wine with delicate blackcurrant flavours, perfect for a mid-day Norfolk Island picnic. Rod and Noeline always have added value in mind, offering tourists both wine tasting and the opportunity to sample some of the island’s freshest, prettiest produce. 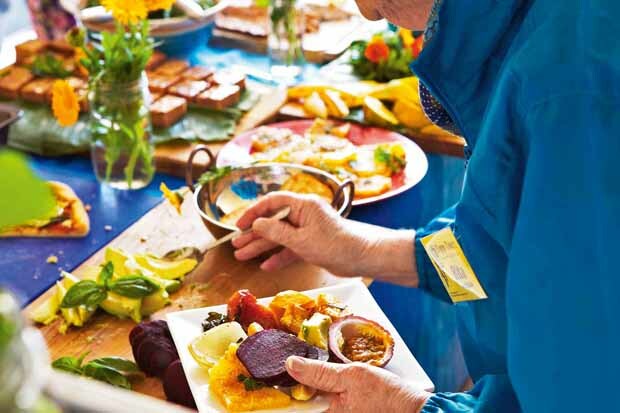 A range of chutneys, relishes, fresh fruits, vegetables and breads form the basis of fragrant herb-bedecked platters which Noelene prepares herself while visitors are busy sipping. 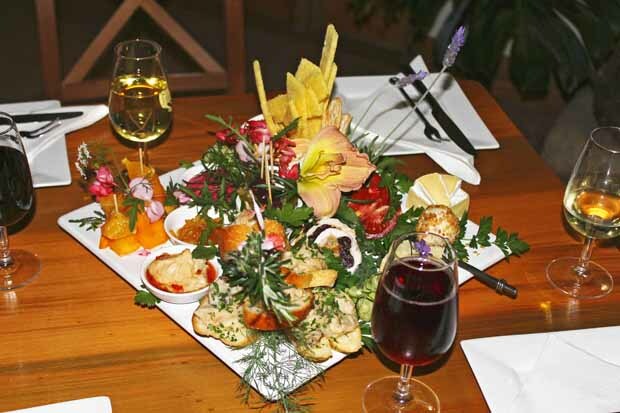 When she introduces the platters, strewn with island flowers, it’s like taking a garden tour on a plate. Whether or not you book a farm, wine or food tour while on Norfolk, or choose to self-cater, it’s impossible to visit the island without encountering innovative, smart, delightful use of small holdings. There is no point in looking for a grocery store – they don’t exist. 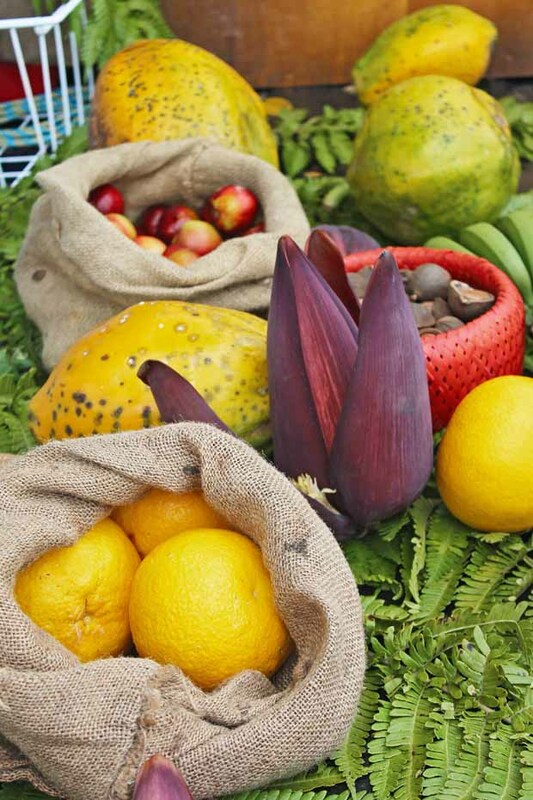 Instead, paw paw, guavas, peaches, plums, caulis, tomatoes and cucumbers can all be found at the Sunday and farmer’s markets, and in the many tiny stalls intriguingly tucked into the doorways of shops as diverse as pharmacies and hardware merchants. Norfolk Islanders are self-sufficient when it comes to produce and any that is spare is either traded with neighbours, given to extended family or sold outside the shop whose owner you just happen to know (or be related to!) and the honesty boxes that accompany these little stalls say it all. Emily from The Hilli Goat Farm, and Rod and Noelene from Two Chimney Wines, and many others on Norfolk Island offer a simple yet highly sophisticated range of experiences. I came away from Norfolk Island wondering why I hadn’t visited this gem before, and knowing I would return again. When I do, who knows what its imaginative residents will have dreamed up next to enable them to live the life they choose on their own patch of paradise. Magnificent Moreton Bay gig trees line the road leading to the Norfolk Blue Restaurant. This property is named after the distinct blue/grey island cattle which began its heritage herd. The farm is now synonymous with fresh and sustainable and just like Emily’s Hilli Goat farm, it has several strings to its operation. 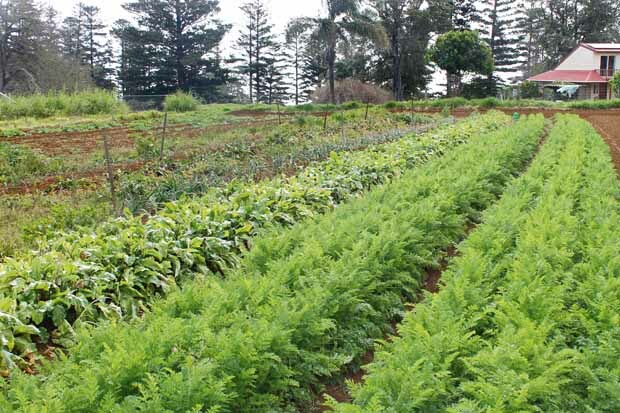 Visitors can enjoy a farm tour in the comfort of a 4 X 4 station wagon while taking in a potted history of the part of the farm which was used in the 1800s by the British-based Melanesian Mission. In what was once the farm’s homestead, a fine-dining restaurant serves up the property’s own beef and a range of the freshest island produce. If you’re a seasoned vege grower, you immediately recognise greens picked no more than an hour or two before they’re served, and I swear the broccoli which accompanied my locally-caught kingfish had come straight from the garden and gone into the pot. Back in town, Norfolk Blue’s business extends to the Blue Bull Café Restaurant, a more casual dining experience where the crispest salads are matched with the farm’s own produce and excellent coffee. 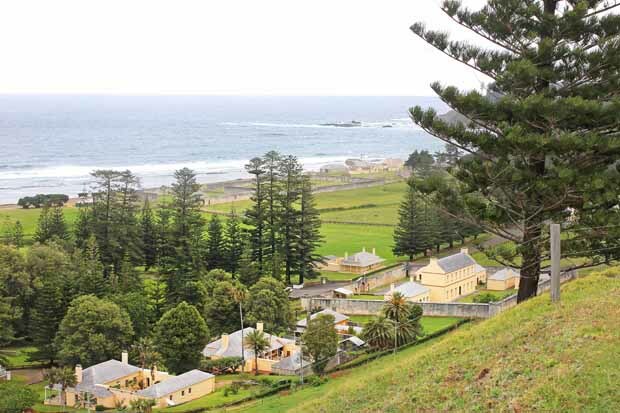 Norfolk Island is a history buff’s haven. It has a World Heritage site at Kingston (one of Britain’s early penal colonies), a well-preserved collection of Georgian architecture with a grim past, and several museums, all within easy walking distance of each other. Coconuts aren’t grown on Norfolk Island, but they feature large in the islander’s heritage and the local cuisine. I found the most delicious coconut bread at Joel’s Café in The Village where the friendly staff whipped up an amazing soy-milk fl at-white while simultaneously obliging me by phoning the local coffee grower (www.ansoncoffee.com) to check out his supplies. The island brims over with the freshest fruit and vegetables. You can head to The Olive Café in the Village for a mouth-watering breakfast (omelettes to die for or fruity French toast that will keep you going all day). Norfolk Blue restaurant specialises in its farm’s own breed of Norfolk Blue beef, but I couldn’t go past the seafood ravioli with island basil and roasted cherry tomatoes. Hilli Restaurant (www.hillirestaurant. com), with a deceptively casual ambience, offers smart service and a good wine list – the local kingfi sh was my pick. 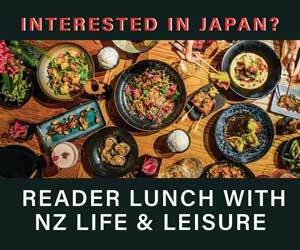 If you’re an eater and a reader, The Golden Orb Bookshop and Café is the place to go for a bite to eat and a squiz at some fascinating local publications. I picked up the cutest kid’s picture book written in both Norfolk and English, and illustrated by the local school kids, to boot!